APiF: What is Styled By Africa and who is behind it? Styled By Africa: Styled By Africa (SBA) is an online content and commerce platform. We – Alae Ismail and Kiran Yoliswa – started out the blog together in 2012 and evolved the concept to include the boutique in 2013 after winning a young entrepreneurs competition with Virgin Media Pioneers and traveling to India to be mentored by Richard Branson. We’re constantly traveling to different African countries searching for the best contemporary African brands that share our design, quality and production values. APiF: What is the mission of SBA and how is it influenced by your cultural heritage? SBA: Our mission is to firstly increase the trade of African brands to the world so we use fashion as a tool for sustainable trade to provide economic opportunities for women in African countries. Most of our brands are owned by women and the majority of their employees are women. We also want to challenge perceptions globally about the quality and creativity of African made products. People are continuously surprised that the products we sell are made in African countries and that surprise is what we serve to overcome everyday. People associate African made products with cheap curio craft type products. But we are bringing brands to a global audience whose quality competes with any international luxury brand. Design-wise they are all thoughtfully and purposefully taking inspiration from different parts of Africa’s heritage and re-inventing them in a contemporary context. Our Tanzanian brand Chichia London takes the Kanga fabrics worn in East Africa as wraps and repositions them in strong silhouettes and feminine shapes. Sindiso Khumalo uses South African inspired graphics, AAKS re-works the traditional weaving of Northern Ghana to make exquisitely detailed colorful raffia bags. With our personal roots based in Eastern and Southern Africa (Alae is from Eritrea and Kiran from Zimbabwe), we’re determined to show that the African aesthetic is about more than the Ankara prints and that we can preserve the textile heritages of our cultures. APiF: What inspired the creation of SBA? SBA: Frustration at how we saw ourselves as young Africans being portrayed in the world. We’re based in London where the images you see of young Africans in the European and American media tend to be very passive and as recipients of charity. We wanted to showcase the countless young Africans who are active agents of change in their communities, and using their creativity to do it. That’s how the blog started in 2012, and the boutique evolved when we noticed that in interviews with designers, they would mention access to international markets as being the biggest challenge in terms of scaling their companies. Simultaneously we had readers from Europe and the USA emailing us asking where to buy the products we were featuring on the website so we saw an opportunity to connect these two communities from our London base. SBA: We met studying an undergraduate degree in Biomedical Science at Queen Mary University of London. Kiran: After that I went on to do a Masters in Development Studies at the School of Oriental and African Studies while working as a journalist for ARISE Magazine. Before that I’d done a series of internships at L’Oreal, UNICEF and in social finance. Alae: I went on to a Masters in Public Health at Kings College University of London while working in the retail side of the fashion industry for different brands such as Calvin Klein, Harrods and Monsoon as well as being a freelance stylist. APiF: Any new designers you adore that we should start following? SBA: All of the brands we feature on the store are chosen because they are our favorites. 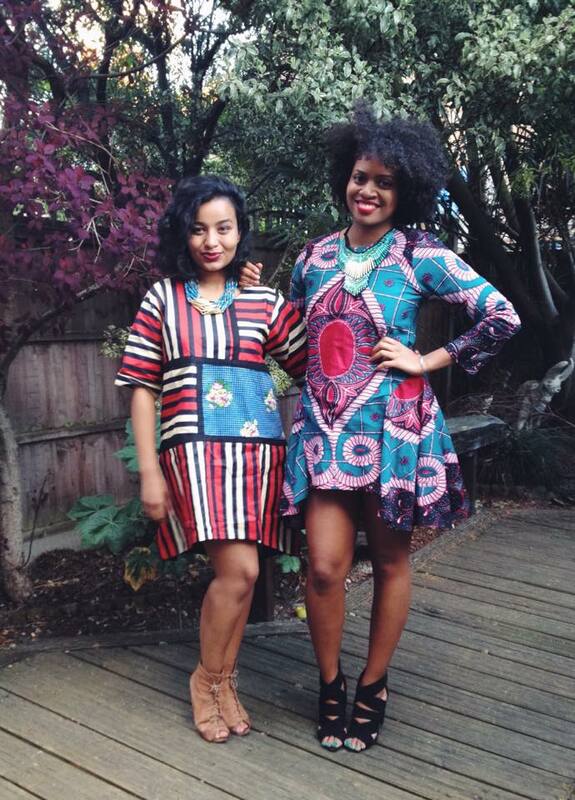 Chichia is East Africa meets London cool- edgy, flirty and fun. We’ve recently taken on two new Nigerian brands after a trip to Lagos in March. Kinabuti make really beautifully tailored jackets, while Grey do modern elegance very well. Sindiso Khumalo’s new collection is very clean and monochrome, a lesson in pared back print. Laduma Maxhosa is a knitwear brand out of South Africa famous for his colorful cardigans, AAKS is a new but fast rising accessories designer who makes woven bags in Ghana and ZAAF make the softest most luxurious leather handbags in Ethiopia that we’ve ever seen. SBA: …the future of fashion! APiF: What is your advice for emerging designers and start-ups in the industry? SBA: Focus as much on getting your production and supply chain sorted out as on marketing. The number of brands that have great imagery and fabulous social media accounts but if you try and order something they’re unable to produce the products they are promoting which is frustrating for customers. At the same time, social media is your best friend in terms of spreading the word outside of your local community. Strong visuals spread fast so invest the time in getting them right. Be resourceful and research institutional partners who can help support your journey. For example the Ethical Fashion Initiative works with African designers and it was through them that we found AAKS’ first collection before she’d even launched and started stocking it on the boutique. Also get in touch with us! We’re always looking for kindred spirit brands to sell on the store.